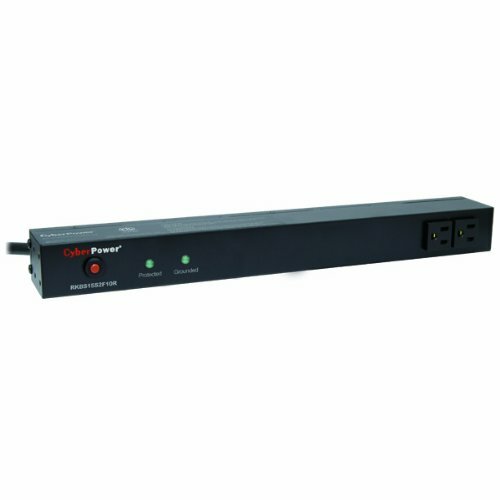 The CyberPower 12-outlet (2 Front and 10 Rear) rack mounted Rackbar surge suppressor (RKBS15S2F10R) provides 120V 15A output and a surge suppression rating of 3,600 joules. It distributes power to 12 NEMA 5-15R receptacles from a single NEMA 5-15P plug. Designed for data centers and other electrically demanding applications, this unit has a rugged, industrial-grade metal housing and a 15-foot AC power cord. It can be mounted either horizontally or vertically, includes a cord retention tray and is ETL/RoHS certified. A lifetime warranty and $150,000 Connected Equipment Guarantee ensures the Rackbar surge suppressor is free of defects in design, assembly, material or workmanship.